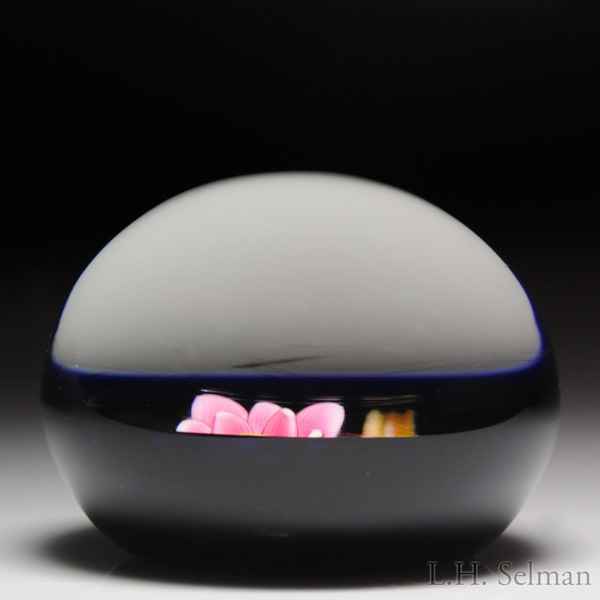 William Manson 2000 "Elizabeth of Glamis" rose paperweight. Three tiers of striped pink petals radiate around a pink and yellow center to form a dimensional rose, accompanied by a long bud, that blooms on a thin brown branch, with many variegated green leaves, in honor of Queen Elizabeth, the Queen Mother. Translucent dark cobalt blue ground. Edition #19 of a limited edition of 100. Signature cane. Signed dated. Diameter 2 5/8".